Coal Fired Pizza in Coal Country: It Just Makes Sense! Ok, so I know I can be accused of having a hometown bias for writing consecutive articles about pizza places named Colarusso’s, but as far as I know Colarusso’s Coal Fired Pizza and Colarusso’s Café aren’t affiliated. I don’t know that for sure, but when I entered the impressive storefront in Dickson City and looked at the menu, it was clear that these 2 restaurants’ similarities might stop at the name on the sign. 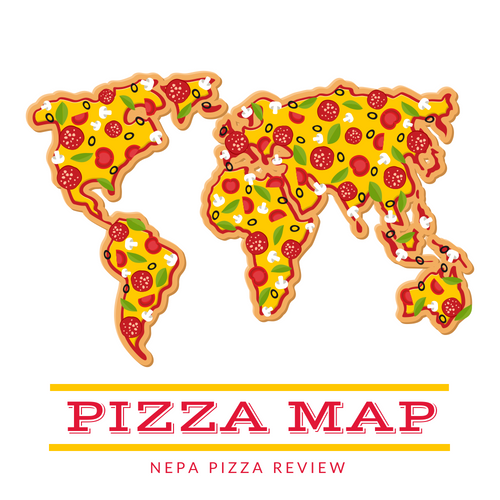 Now, NEPA is known for 2 things – Pizza and Coal, so it’s an ingenious idea to combine the two. I’ve eaten my share of pizza from wood and gas fired ovens, but never coal, so for that reason I’ve been chomping at the bit to get my hands on this new concept. My first surprise, and indicator that this was a different Colarusso’s was that their signature pizza was not Old Forge style, rather a small round pizza – margarita style fired in a 900 degree oven. When the friendly waitress brought me my pizza, it looked like a work of art from a food magazine. I was blown away by the smell of the fresh basil, ripe plum tomatoes, and cheesy blend. Since the pizza was literally steaming for nearly 5 minutes, a normal person might take their time and wait for it to cool down, but I’m a big dumb animal, and very hungry to boot, so I quickly took a bite and promptly removed all 7 layers of skin on the roof of my mouth! The first thing I noticed was that the pizza was not crunchy at all, it was more like a soft pita or flatbread. Strangely, this didn’t take away from the quality of the pizza, rather it put it in a different class. This pizza isn’t about being crispy, cheesy, and traditional NEPA – it’s about flavor, fresh ingredients, and texture. There is a lot to consider in this complex pizza, but the thing that stands out are the crushed plum tomatoes both under and on top of the cheese. If you’re someone who doesn’t like warm tomatoes, or a chunky sauce this isn’t for you. Fortunately for me, I’m a big fan of a nice hearty sauce and I liked the freshness of the tomatoes combined with the fresh basil sprinkled on top. Combine these flavors with the cheese blend of mozzarella, provolone, and parmesan cheeses (as I recall from the menu) and it created a symphony of taste that I really enjoyed. The Bottom line: This pizza is not for the masses. It’s not the type of pie that you’d grab a few trays to bring to a party with children or adults who are accustomed to more traditional NEPA pizza. There are few other pizza places in NEPA which provide a similar product (Cara Mia’s in Dunmore and King’s in Mountaintop are the only places I can remember having anything similar). Personally, I loved the pizza, as it accomplished exactly what it set out to do, but I don’t think everyone would agree. I look forward to returning and checking out the rest of their menu. I should add that this place has a really cool bar and atmosphere! Feel free to comment and debate! Check out what the Keystone Pizza Critic has to say about Colarusso's Coal Fired Pizza on a recent joint review! Next time, try the black and blue, DELISH! If you can find room, the canoli PIZZA is a dessert you'll not soon forget. We are huge fans! What exactly does the black and blue consist of? Canoli pizza is definitely something I've never heard of! Are you kidding me?! That photo looks great...if the pizza tastes half as good as it looks it'll be one of the best I've had in PA.
Based on some of your other comments, you seem to have pretty discriminating tastes, and a sophisticated pallete, so I would highly recommend this pizza for you John! Okay, so I tried their regular pie tonight and I have to say I'm impressed with the flavor. The crust wasn't exactly what I was expecting, but that doesn't mean it wasn't good. It was just more wafer-like and not really crispy (had I remembered your review I would have been expecting just that). The crust itself still had a nice flavor to it though, so I had no problem with it whatsoever. I wouldn't really call it a Margherita pie (although people have varying definitions), but it was definitely different and very good. They actually have something they call a Margerita pie on the menu, but it is made with sliced tomatoes which is not really typical of an authentic Margherita pizza. They do, however, have something called a Sofia Loren pie which seems exactly like a traditional authentic Margherita pizza. Chunky tomato sauce, dollops of fresh mozzarella, and basil. I'm looking forward to trying that one. Anyway, thank god for your website. I'm stuck in a hotel because my kitchen caught fire and I'll be here a couple weeks. Without your reviews I'd be relying on luck to find a good place.